Finn's medal citation states he continued to "return the enemy's fire vigorously"
PINE VALLEY, California (CNN) -- Dozens of America's greatest military heroes are gathered in Chicago, Illinois, possibly the last large gathering of living Medal of Honor recipients. 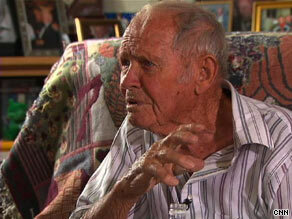 John Finn, 100, at his California ranch, said he was just a dutiful soldier. That "hero stuff is a bunch crap," he said. Among the men with light blue ribbons holding a star around their necks signifying uncommon bravery, will be John Finn. Finn, who received the nation's highest medal for valor for his actions during the Japanese attack on Pearl Harbor, turned 100 this summer, the oldest living Medal of Honor recipient. Finn was stationed at Kanoehe Bay Naval Air Station, where the Japanese struck five minutes before attacking Pearl Harbor, across southeast Oahu Island from Kanoehe Bay. Finn recalled how a neighbor was the first to alert him, when she knocked on his door saying, "They want you down at the squadron right away!" Finn saw the first Japanese plane before his car even reached his hangar. "I put that old car of mine in second gear and wound it up getting down to the hangar where I could be where my guns and ammunition were," Finn said. One of the first things he did was take control of a machine gun from his squadron's painter. "I said, 'Alex, let me take that gun,' " Finn explained. "I knew that I had more experience firing a machine gun than a painter." "I got that gun and I started shooting at Jap planes," Finn said in the salty language not uncommon among veterans of that long-ago war. But Finn's machine gun was right out in the open, nothing protecting him from the attacking pilots. He was wounded in the head, the arm, the hand and the foot, but Finn fought on, a one-man counterattack to the surprise air raid that pulled America into World War II. The Medal of Honor is the highest award for valor in the U.S. armed forces. There have been fewer than 3,500 recipients in the medal's 140-year existence. Fewer than 100 recipients are believed to be alive today. Finn talked to CNN at his ranch in the desert east of San Diego, California. He surrounds himself with reminders of his life -- his entire life, not just that one infamous day out of 100 years. There are pictures of his wife, Alice, who married him before Pearl Harbor and was by his side until 1998. The hillside outside his home is covered with old cars, old trucks and even an old military ambulance. But the first thing one notices when visiting Finn's ranch is the sign at the road, with a painting of his medal next to his name. "He continued to man this gun and to return the enemy's fire vigorously and with telling effect throughout the enemy strafing and bombing attacks and with complete disregard for his own personal safety. It was only by specific orders that he was persuaded to leave his post to seek medical attention. Following first-aid treatment, although obviously suffering much pain and moving with great difficulty, he returned to the squadron area and actively supervised the rearming of returning planes," the citation stated. With Japanese still attacking, getting his wounds treated wasn't a priority, Finn said. "Medical help comes later. If you're busy shooting a machine gun or a rifle or a pistol or doing anything, you can't worry about getting medical attention," he explained. Less than a year later, Finn, out of the hospital and recovered from his wounds, was back on duty with the Navy in Hawaii. Adm. Chester Nimitz presented Finn with the Medal of Honor for his bravery, joining the ranks of the men, and one woman, recognized with the nation's highest award for heroism. These days most medals are awarded at the White House, but with the war heating up, such a long trip was out of the question. In fact, his first visit to the White House came in the spring when President Obama invited him for a visit. Back at his ranch, Finn bristled when asked about being called a "hero." "That damned hero stuff is a bunch crap, I guess. Well, it is one thing that I think any man that is in that, you gotta be in that position," Finn said. "You gotta understand that there's all kinds of heroes, but they never get a chance to be in a hero's position." Fewer than 100 men who have received the Medal of Honor are alive today. More than half of them are expected in Chicago this week for the annual Congressional Medal of Honor Society Convention. But because they are all veterans of World War II, Korea or Vietnam, their ranks are shrinking every year. The men from more recent conflicts, like Somalia, Afghanistan and Iraq, were all awarded the Medal of Honor posthumously. And this week, while many of those living recipients gather in Chicago, Obama will present the latest Medal of Honor at the White House to a soldier who fought and died heroically in Afghanistan.